January 13 & 25: The year began with our last two performances of Julep as part of the NC Dance Festival tour. First, a Sunday matinee at UNC-Wilmington then a Friday evening show at UNC-Charlotte. March 13-16: Again this year, I traveled to the American College Dance Festival’s Mid-Atlantic Regional Conference to represent the company and teach classes. With class scheduled at 8am this time, the turn-out was smaller than the last year, but still about two dozen collegiate dancers got to learn parts of Finding Place choreography (in addition to getting in the company’s traditional technique class). April 28: We perform Journey at NC Dances in Cary, NC. 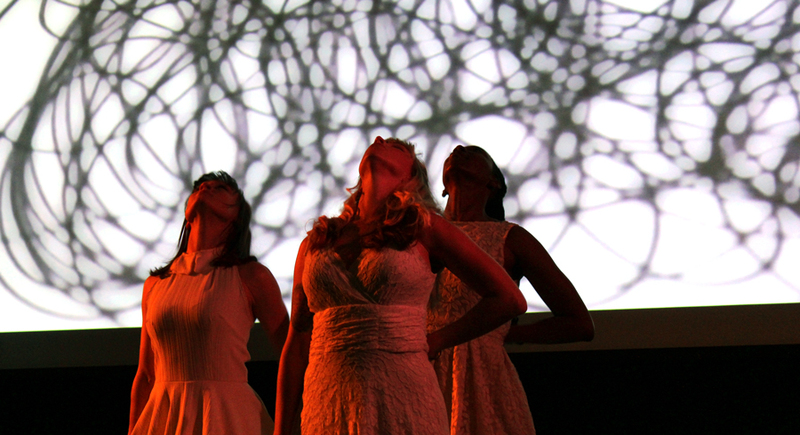 Journey was originally created for NC State University’s Panoramic Dance Project, so this marked the first time Code f.a.d. dancers got to perform the work. We also brought in a guest dancer for this show – Sarah Putterman! We hope we get to work with Sarah more in the future. May-July: Code f.a.d. Company was quiet this summer, but there were certainly creative juices still flowing, preparing for the busy fall season ahead. August: The company finds two new rehearsal “homes” for 2013: Barre-Up and Cirque de Vol Studios. Holding our Saturday classes at Cirque de Vol has given us the opportunity to make this the first season we open company technique class to area dancers, and we have had a great time inviting more folks to join us a few Saturdays each month! Following auditions after one of these open company classes, we are also pleased to welcome three new dancers to our group: MacKenzie Buice, Krystal Lynch, and Anna Maynard. You can expect to learn more about all of these lovely ladies in the coming months on the blog. Rehearsals are also in full swing for Dear Nature, our new work inspired by the Artspace exhibition of the same name, including artwork by Natalie Abrams, Mi-Sook Hur, and Cynthia Camlin. September 6: First Friday at Artspace brings the partial premiere of Dear Nature in Gallery 2. Just like in February, we performed three 10-minute shows throughout the evening, to packed crowds! September 12: Beetlejuice, Beetlejuice, Beetlejuice! Stuck right in between our Dear Nature performances came 2013 SPARKcon, and being we have participated in the festival for the past five years, we couldn’t let this one slip by without a Code f.a.d. appearance. The company invited some guest dancers from AWW Performance Company to join us in an interactive performance following the Beetlejuice theme (chosen by this year’s filmSPARK organizers). The show was complete with the super talented Todd Buker (composer to much of our work) performing as the sandworm! September 18: Back to Artspace for the full Dear Nature premiere, and it was such a great experience to perform in the gallery among the artwork that inspired the piece. This show also marks the debut of two new artists in our ranks: composer Julia Price and poet Jessica Mansell Temple! We are excited to work with both Julia and Jessica on more new work in 2014. October 12-13: I attended the NC Dance Alliance’s Annual Event as our company representative to teach classes (more Finding Place repertory is taught to high school attendees and professionals) and to speak about our dance films in a lecture/showing with other dance filmmakers based in NC. November 13-17: Destination by Michael Kors (one of our fashion-inspired dance films) makes it into its first big film festival! I traveled to Wilmington to attend Cucalorus for the screening (and got to see many other films and speak with filmmakers of all kinds at the events – inspiration was gathered for many new works to come). December 6-12: The last performance of 2013 was on December 6 in Winston-Salem, as part of Movies by Movers IV. We performed a few excerpts of Dear Nature, adding video projections to those sections we took and titling these portions A Few Southern Legends. I’m excited to turn some of these sections into stand-alone dance films in the coming year. Also, across this entire week I was honored to have the opportunity to teach dance students at Jordan High School in Durham, NC. The advanced “company” dance class worked on a dance film project while junior and senior-level technique classes learned Horton modern dance technique. And there it is… well, was. What a great year 2013 turned out to be for Code f.a.d. Company – lots of new faces and new dances! So, what does 2014 have in store for us? I’m tempted to just say wait and see, though I’ll give you a hint to be on the lookout for new dance films (hopefully) hitting the festival circuit in 2014. (And don’t worry, we’ll post some clips and photos from the shoots online, too.) Thank you for continuing to support the work that we do, for supporting dance, and we wish all our fans a very Happy New Year! While the majority of the company’s time is spent preparing for our next big show, Finding Place, I decided to take a break to think back to our last big show – Fashion Briefs. (Also, I just sometimes need a break from the creative process to remind myself that even though I may feel blocked at the moment, this happens with every new work and eventually the work will get finished and will premiere!) We have recently received some wonderful photos (by Siobhan Hanna Photography) from our Fashion Briefs performance in Washington, D.C., and so I’m taking this FAD Friday to share some of my favorites. *I especially love how some of the McQueen images capture the ghostly images of the late designer in the background! While the end of the calendar year marks only the halfway mark of the Code f.a.d. Company season, I feel perhaps we are overdue for a moment of reflection on the company’s accomplishments during this year (the tail end of our 4th and now the first half of our 5th seasons). I am personally taking some time to reflect on my life this evening, so why not do the same for this huge portion of my life that is Code f.a.d.? Gerren takes Penelope for a dip in the hot tub! January 26-28: The company premieres Calvin Klein: Casual Friday and Destination by Michael Kors at the Greensboro Fringe Festival – a great opportunity to test out a few of the new sections of Fashion Briefs before the BIG premiere in March. February 11: Fashion Briefs photoshoot in the freezing cold on NC State’s Centennial Campus. Looking back, I think the cold was worth dealing with, since we got some great shots! March 5: Film shoot for Vera Wang: The Dress at Aldersgate Church in Durham, NC. We got almost everything accomplished in about an hour and a half, but then the zipper on Christina’s dress broke during a particularly enthusiastic back shoulder roll! I finished up the evening with a few close-ups of Natalee, but we knew there would be some missing pieces we’d have to get later after fixing the costume. March 6-11: About half the company makes the long drive to Birmingham, Alabama, to perform sections of Fashion Briefs in a shared concert with local company, Sanspointe. This marked the first time I have traveled back to perform in Alabama since graduating from the University of Alabama in 2000; the concert was both well-attended and well-received! Read a short review here. March 18: Finished up the Vera Wang film shoot (we got the dress fixed while in Birmingham) in the studio at North Carolina Dance Institute! March 19-25: This is the big one – the premiere of the full, evening-length version of Fashion Briefs! This was our first show in the Burning Coal Theatre at the Murphy School in downtown Raleigh, and we loved having a “home” space for the entire week. In total, Fashion Briefs premiered with 12 sections – one section completely on film (Vera Wang: The Dress) and most of the other 11 including live dance and video projections. While I wouldn’t rule out adding another designer in the future, for now the “live version” feels complete. The next step for Fashion Briefs is to create more dance film sections; ultimately, I hope to create a film version for all 12 parts (so that means 10 more sections to make as we travel into 2013). If you aren’t sure when the second film section happened, just keep reading! *One of my favorite memories of this concert was our “preview” night on Thursday. Lots of NCSU students were in the audience this evening – members of the Arts Village, a few NCSU Dance Company dancers, and most of my dancers in Panoramic Dance Project! I loved being able to share this work with them all, and I hope we can continue to expose the collegiate (and even younger) audience to modern dance. April 18: In preparation for our summer project with the NC Museum of Art, I toured the El Anatsui exhibition with Education Coordinator Kristin Smith. The artwork was amazingly inspiring; it made me excited to begin the next creation! 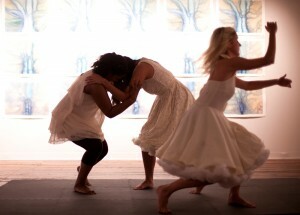 May & June: Busy creating and rehearsing Finding Place. We also created this blog during these months, so go back and read our first posts about the Finding Place process if you haven’t! July 7: Our work inspired by the artwork of El Anatsui premieres as part of the NC Museum of Art’s Summer Dance Series! In this showing, Finding Place was about 15 minutes in length, and at the time, I wasn’t sure if it would continue to grow within the Code f.a.d. repertory. Not long after, though (and partially because of feedback received at our performances), I decided I did want to continue with and expand the piece. As you may already know, we are adding more stories, more dancing, and some film segments to turn Finding Place into our next evening-length work (to premiere in early 2013). Overall, this first part of our Finding Place experience came at just the right time to energize myself (and perhaps the entire company) as we prepared to enter our 5th season. We worked in a very fast and focused way to create the work and invited in several guest dancers for the museum performances. The energy and contributions of these new dancers (a variety of community/professional dancers and NCSU student dancers) really helped shape the work and push the company into a new process of more collaborative dance-making. August 6-10: During my “vacation” to New York, I (of course) did a bit of company work, as well – amongst taking dance and aerial yoga classes and seeing shows! Monica and I shot the first film segment of Finding Place in Central Park; you can read more about her contribution to the piece in the August 10 blog entry here. September 13 & 14: SPARKcon – downtown Raleigh’s Creativity Festival! Finally we get to perform (at least part of) Indulge again! Part of the SPARKcon Opening Ceremonies, Code f.a.d. – along with two guest dancers – takes Indulge to the Raleigh Amphitheater stage. This was a great opportunity to bring our work to a large (and fairly non-dance) audience, since we performed directly after the fashionSPARK Runway Show. The following night we then performed a smaller version of Finding Place in Vault Yoga’s studio space on Fayetteville Street. These smaller, more informal SPARKcon showings are a great way to really interact with your audience, and I’m happy the company was able to be involved in our 5th SPARKcon this year. September 28-30: After a successful Kickstarter campaign to raise needed funds, we head to the NC coast to shoot the next Fashion Briefs dance film! The forecasted rain luckily held off until we got all our needed scenes done for Destination by Michael Kors. Thank you so much to all who contributed to the campaign! We are a bit behind on film editing and mailing out your other Code f.a.d. goodies (buttons, coffee mugs, and photos), but you can expect to receive all we’ve promised you in early 2013. October 12: Two Horton/Code f.a.d. technique classes taught to dancers at Northern Guilford High School in Greensboro. The students did very well learning a bit of Julep phrasework, as well, as a teaser for the upcoming NCDF tour performances. October 19-21: I attended the NC Dance Alliance’s Annual Event in Greensboro, NC, to represent Code f.a.d. Company and the NCDA itself (as I am a new board member to this state-wide dance organization). It is always wonderful to catch up with other dancers and dance educators from across the state and keep Code f.a.d. in their radar even if we are not performing in the concert that weekend. November 2: Last NCDF tour show for 2012 – this time we are performing Julep at UNC-Greensboro’s Aycock Auditorium. Christina always loves this tour stop since she went to college (and danced) at UNC-G.
November 3: Company brunch! I made a zucchini frittata, Christina made pumpkin-chocolate balls, Jill brought supplies for pomegranate/raspberry mimosas… yum! I certainly needed a bit of a dance break after a packed fall season (that wasn’t over yet). December 1: This was our most efficient Code f.a.d. Board of Directors’ meeting to date. Enough said. December 22: We had our last rehearsal of 2012 (working hard on Finding Place for the big February show at the Durham Arts Council), took a few hours off, then reconvened for the annual Code f.a.d. Holiday Party! …and that brings us to tonight, December 31, the last night of 2012, and what does it all add up to? Thinking back, more than the shows, the classes, or the rehearsals, I’m left thinking about the people that make this company what (and who) it is. 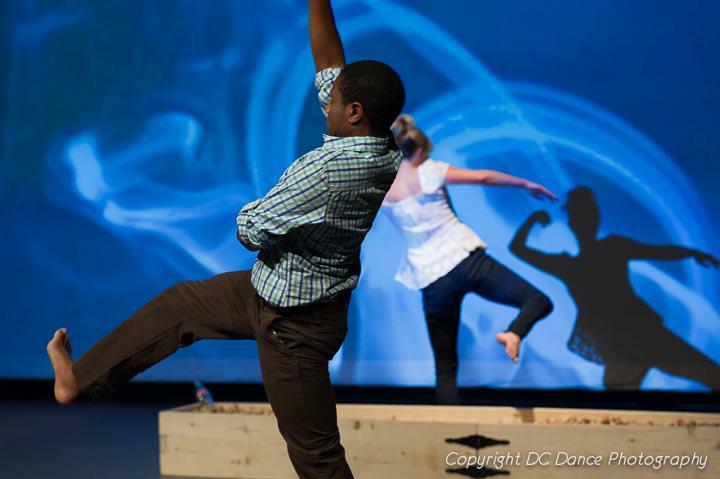 Our board members, our artists, our composer, and above everything else – our dancers are the heart of Code f.a.d. Company. While we did not “officially” begin as a company until the fall of 2008, this journey really began in the summer of 2006, when Jill, Christina, and I all met each other and danced in David Dorfman’s Underground at the American Dance Festival. During the following year, I met Gerren and Natalee through my work at NC State, and while neither of those two actually committed to Code f.a.d. when that official start date finally came – neither really stopped working with us either. (They couldn’t leave!) As we collected Kelley and Brooks through open auditions, the group started to solidify. We’ve gained a few others and lost a few that began with us through these past 4 1/2 years, though only one has really passed the test and stuck it out. (That would be Kristina, of course, who is going on her second year with the company.) All I can think is how wonderful it is to have these relationships weather the test of time – and the test of tempers, of injuries, of long car trips, and whatever else these seasons have thrown at us. I am so lucky to be a part of Code f.a.d. – to have these people in my life, and I eagerly look forward to a wonderful 2013 full of film, art, dance – and friendships. Thank you to all our fans who support what we do. I hope to see and meet more of you in the coming year, and we will do our best to continue sharing meaningful movement-based art. After a very successful premiere of Finding Place at the NC Museum of Art, it is time for a break! So the dancers and myself take from mid-July to mid-August off from regular rehearsals. A few of us actually take real vacations, while the rest find the time to catch up in their “regular” lives of 9-5 jobs, laundry, taking care of kids, going to school, etc. Most modern dancers I know love to take pilgrimages to NYC as often as we can. We take classes, see shows, and generally just enjoy feeling like New Yorkers without having the sky-high rent and being able to know when we go back home we’ll have washers and dryers in our homes. My trip was no different; I took several modern dance classes (at The Ailey School and Dance New Amsterdam), some anti-gravity yoga classes, and went to see Zarkana at Radio City (thank you Living Social deal) and (a definite highlight) Sleep No More! This was also a bit of a “work trip” in that I worked with Monica on a new film section of Finding Place, which we shot in Central Park. The city where I grew up as a little girl was very hot and humid. We only have two seasons there: hot and rainy and hot and not so rainy. … One night when it was bedtime, we lost power. It had been a very hot and humid day and thankfully it started to rain after we lost power. My dad had a brilliant idea; he opened our apartment door so we could get some of the refreshing rainy air into the apartment, and he grabbed a mattress for my mom, my younger sister, him, and myself to lay on while the power came back. When it did, I didn’t want to go back to bed in my room, it had been very fun to lay all together, hearing the rain fall.